Where to Bring Your Moms at the Queen City of the South? - Choose Philippines. Find. Discover. Share. Where to Bring Your Moms at the Queen City of the South? Here’s a list of places in Cebu where you can bring your moms to enjoy her special day. Enjoy a cup of coffee with your mom to start the day! A cafe surrounded with glowing white roses. The 10,000 Roses Cafe is located at Barangay Day-as in the municipality of Cordova just right beside the floating restaurant. Enjoy the stunning garden while sipping your coffee. READ: A Garden Of 10,000 Glowing White Roses In Full Bloom, Only In Cebu! Instead of giving a bouquet that will just wilt after a few days, bring her to a flower garden. Sirao Garden was one of the first flower gardens opened to the public. Known as the “Little Amsterdam” because the garden resembles the flower fields of Amsterdam. Sirao Garden is located at Barangay Sirao, Cebu City. A popular attraction seen in Cebu Transcentral Highway (Busay-Sirao-Balamban). The garden is open between 7:00am to 6:00pm. It features the Celosia flowers, locally known as ‘Burlas,’ in flame colors: yellow, red and orange. We can’t all afford to build a monument for our moms like this but bringing her to the temple that is dedicated also to a mom would make her feel special. The temple was constructed in the year 2012. It was built as a symbol of the undying love and ceaseless devotion of Teodorico Soriano Adarna to his wife for 53 years, Leah Villa Albino-Adarna. Offer prayers for your mom and give special thanks to the Lord how blessed we are to have them. 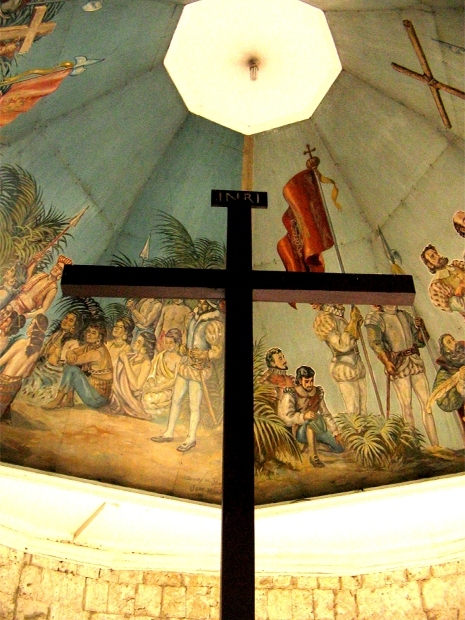 What amaze tourists aside from the rich historical value of Magellan’s Cross are the testimonies of devotees of the miracles brought by their regular visit to the cross. You’ll find candles stacked just beside the base of Magellan’s cross. Those are the prayers offered by devotees and visitors that passed by the small chapel. Make your Mother’s Day a grand celebration by serving lechon. Cebu is synonymous to lechon in the Philippines. ebu is known for its crispy and flavorful lechon and is a thriving business in the province. There are many establishments that sell whole lechon and even per kilo. Enjoy a relaxing day by picking strawberries for your snacks or dessert with your mom. Cebu’s strawberry farm is found in Cantipla. The town proved that it could provide a healthy environment for growing strawberries, and it's giving travelers another stop in their chock-full Cebu itinerary. To cap off the day, hear mass together with your mom. The Church of Nuestra Señora del Pilar was built around the years 1846 to 1868 and was completed in 1881. The church features pre-war frescoes on its ceiling and illustrate different biblical scenes like the Seven-day Creation of the World and the Seven Sacraments. Always remember to treat your mom like a queen not just on Mother’s Day but everyday.